The BAYROL range includes products specially adapted to quickly and safely bring your pool water back to normal conditions. BAYROL Problem Solver products are easy to use, very efficient and react rapidly. 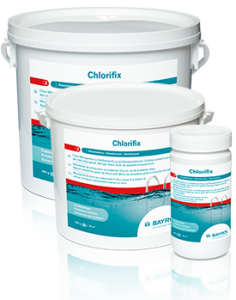 Chlorifix are fast dissolving chlorine granules for a swimming pool shock treatment when problems with the water treatment occur. Chlorifix can be dosed directly into the water. Made from high quality raw materials, Chlorifix quickly and effectively increases the active chlorine level. The special material in the form of micro spheres produces less dust during dosing, compared to standard chlorine granules. When problems occur, dose 200 g of Chlorifix per 10 m³ directly into the pool. Use biocides safely. Always read labelling and product information before use. 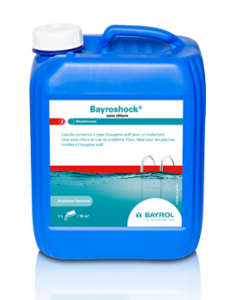 Bayroshock® is a chlorine free liquid product based on active oxygen for a swimming pool shock treatment. Since Bayroschock® consists of the same raw material, it is particularly suitable for pools treated with liquid active oxygen products, such as Softswim® or Bayrosoft®. With the use of Bayroshock®, your pool water remains completely chlorine free. When problems occur, dose 1 L of Bayroschock® per 10 m³ directly into the pool. 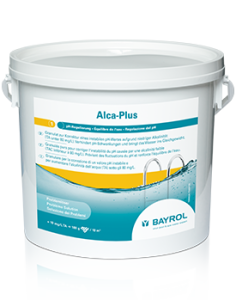 Alca-Plus is a granular product for stabilising a fluctuating pH level due to a value of the total alkalinity (TA) below 80 mg/L. The total alkalinity has a huge effect on the pH value, and can make adjustment extremely difficult in case of a deviation of the recommended set value. Alca-Plus prevents pH fluctuations, and brings the water back into balance. To raise the TA by 10 mg/L, dose 180 g per 10 m³ into a separate bucket, and add the solution directly into the pool water. Chloryte® are highly concentrated calcium hypochlorite chlorine granules. They do not contain a chlorine stabiliser and dissolve quickly for a fast and efficient swimming pool shock treatment. 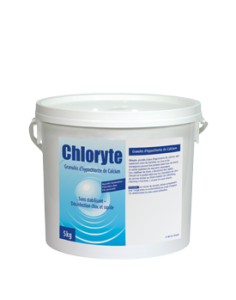 The use of Chloryte® granules eliminates the risk of an exceeded level of chlorine stabiliser (cyanuric acid). When problems occur, dose 200 g Chloryte® granules per 10 m³ directly into the water. Chloriklar® are fast dissolving 20 g effervescent chlorine tablets for a swimming pool shock treatment when problems with the water treatment occur. The tablets are dosed via the skimmer, or alternatively dissolved in a separate bucket and the solution added directly into the water. 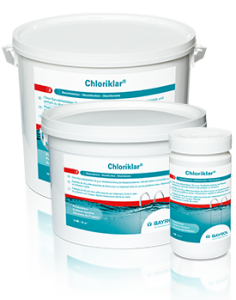 The special Chloriklar® formula quickly and effectively increases the active chlorine level. When problems occur, dose 10 Chloriklar® tablets per 10 m³. 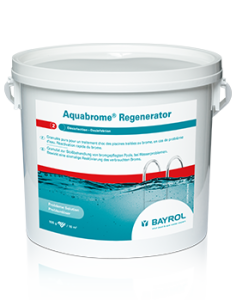 Aquabrome® Regenerator is a granular product for a swimming pool shock treatment in pools treated with bromine. The active oxygen granules regenerate the bromine consumed by oxidising organic impurities one time. The regeneration increases the bromine level and thus carries out a shock treatment, which prolongs the disinfection effect. When problems occur, dose 100 g Aquabrome® Regenerator per 10 m³ directly into the water. 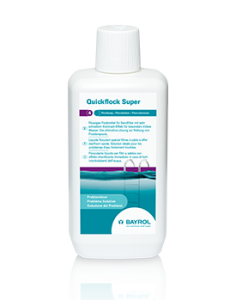 Quickflock Super is a liquid flocculant for sand filters. It contains a clarifying effect which quickly turns turbid water into crystal clear water. The special formulation of Quickflock Super carries out an immediate „sharpening“ of the filter, which allows even the smallest of dirt particles to be retained in the filter. Quickflock Super is the ultimate solution for recovering cloudy pools due to its rapid flocculation capacity. To „sharpen“ the filter, dose 100 – 200 ml of Quickflock Super for 0 to 100 m³ directly into the skimmer.